Located in the northern side of Isla Mujeres, Suites Los Arcos offers accommodations equipped with coffee makers, cable TV and air conditioning. The property has luggage storage services and the front desk operates 24 hours. The rooms at Suites Los Arcos also feature a microwave, a fridge and a balcony offering city views. The private bathroom has a shower. Wi-Fi connection is possible on each room for free. Suites Los Arcos is placed on Hidalgo Avenue, where a variety of restaurants, bars and night life entertainment can be found. Cancun is 30 minutes away taking the ferry boat. Make yourself at home in one of the 21 individually decorated guestrooms. Private bathrooms with showers feature complimentary toiletries and hair dryers. Conveniences include safes and separate sitting areas, and housekeeping is provided daily. Make yourself at home in one of the 124 air-conditioned rooms featuring refrigerators and iPod docking stations. Plasma televisions with satellite programming provide entertainment, while complimentary wireless Internet access keeps you connected. Private bathrooms with showers feature complimentary toiletries and hair dryers. Conveniences include phones, as well as laptop-compatible safes and desks. Grab a bite to eat at Kalak, a restaurant which features a bar, or stay in and take advantage of the room service (during limited hours). Quench your thirst with your favorite drink at the poolside bar. Continental breakfasts are available for a fee. Grab a bite to eat at one of the property's 3 restaurants, or stay in and take advantage of the room service (during limited hours). Snacks are also available at the coffee shop/café. Mingle with other guests at the complimentary reception, held daily. Unwind at the end of the day with a drink at the bar/lounge or the poolside bar. A complimentary hot/cold buffet breakfast is included. 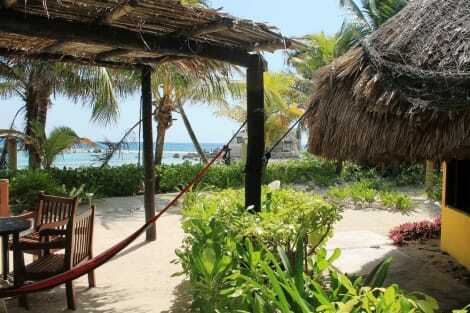 The 5-star Isla Mujeres Palace Couples Only beachfront resort is just 1.9 km from Garrafon Natural Reef Park. Its facilities include an outdoor pool with a swim-up bar, a spa and treatment rooms, a fitness centre, daily activities and nightly entertainment, a lobby bar, and Azul restaurant serving international dishes. The stylish, modern rooms feature flat-screen TVs and mini-bars. A stay at Hotel Marcianito places you in the heart of Isla Mujeres, within a 10-minute walk of Norte Beach and Parador Fotográfico. This hotel is 1.3 mi (2.1 km) from Garrafon Natural Reef Park and 4.7 mi (7.5 km) from Dolphin Discovery. With a stay at Villa Kiin, you'll be centrally located in Isla Mujeres, steps from Norte Beach and 3 minutes by foot from Aztlán Galería. This beach hotel is 1.6 mi (2.7 km) from Garrafon Natural Reef Park and 5 mi (8 km) from Dolphin Discovery. Enjoy a meal at the restaurant or snacks in the coffee shop/café. The hotel also offers room service (during limited hours). A complimentary continental breakfast is served daily. lastminute.com has a fantastic range of hotels in Isla Mujeres, with everything from cheap hotels to luxurious five star accommodation available. We like to live up to our last minute name so remember you can book any one of our excellent Isla Mujeres hotels up until midnight and stay the same night.